Download Free Video Download Blogger Template is a premium looking and professionally designed magazine blogger theme. Video Download Blogger Template is a creative Blogger video theme suitable for all types of videos, filmmakers, vloggers, Youtubers, streamers, gamers, movies, magazines, video blog (vlog) websites. Whether you want to build a personal blog including website or a video showcase for your company, Video Blogger Template will be a tremendously intuitive, suited to be deployed for a number of different websites and projects of all kinds. With Video Blogger Theme, you can easily present your videos, images and articles in an attractive way. 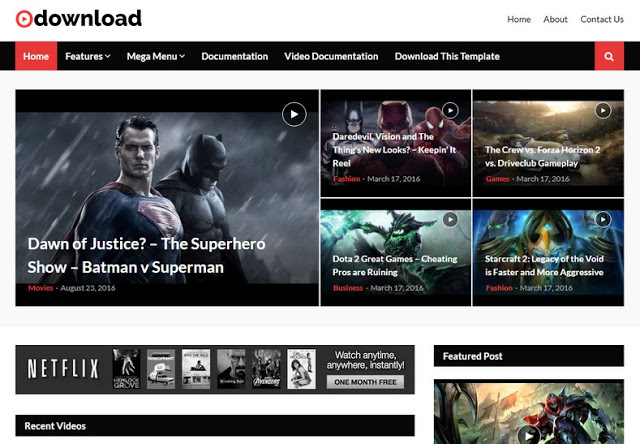 Download Free Video Download Blogger Template professionally designed magazine blogger theme.